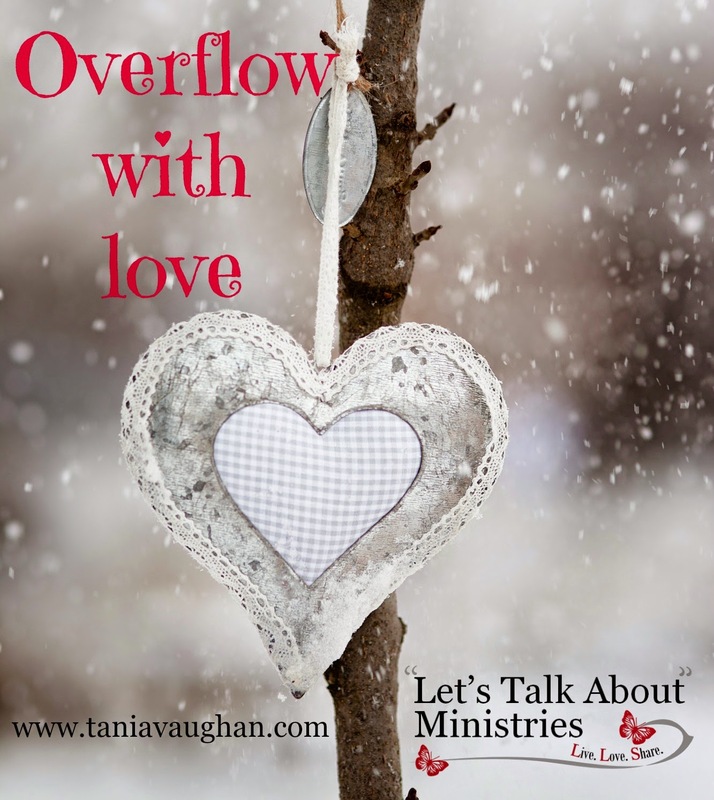 The overflow of abiding in the love of God is love itself. As love increases it overflows to others, you do not love more but God increases the love within to create the overflow (1Thessalonians 3:12). In the midst of a busy and demanding life where all you seem to do is give, you may wonder where on earth you will be able to find the reserves to love others, to love more - there's just no time or energy left. Stop striving to love, you do not need to look for more people to love, you do not need to look for more ways to give, you only need to increase the love within. When Jesus commands that we love one another; our friends, enemies, the poor, needy, down trodden and broken. He is not asking us to go from where we are to a place where there are more people to give to, he is asking that we turn to him because love comes from God (1 John 4:7). "Love as I have loved you" (John 13:34). You are to love in the way that Jesus loves you, and how did he love? "As the Father has loved me, so I have loved you" (John 15:9) Love comes from God and God is love. If you go out trying to love people without first being filled with God's love it is just noise and nonsense (1 Corinthians 13). "This is love: not that we loved God but that he loved us..." 1 John 4:10a. If you are burnt out, worn out, fed up, overwhelmed and empty - then do not go out and love others. Go and sit before God, read his word, talk to him, receive from him and allow him to fill your heart to overflowing. What is in your heart is what will flow from it - when God instructs that we guard our hearts with all vigilance he means for us to keep it full. If it's empty bring it to him, don't try and give it to others. You will love, and have the capacity to love when you are filled with his love. The command is not to love others and love God but to love God first, the order is important. Loving from a heart overflowing with God's love that gives those around us the opportunity to see God at work. God's love shines God's light. Your post reminded me of the quote, "Eyes are the window to the soul." When we a full of God's love—eyes sparkle and expressions are warm and inviting. When we are full of His love we love others. Visiting from Grace and Truth, so blessed to find both here. What wonderful truths about God's love, Tania! "...love God first, the order is important." Thanks for the reminder that I cannot love--truly love--without being filled to overflowing with the love of God. He guides every loving thought, every loving action. Beautiful post! Thank you Sabra - I pray that you will truly know that overflowing love of God. Excellent distinction here. Love is not striving, but a natural overflow of the love of our Father in us. Very thought-provoking! This is fantastic and I am going to be featuring it for the next round of Grace & Truth! Please stop by tomorrow and grab your "I've Been Featured" button for this post, it's truly excellent & I love the urging for a right perspective on the source of our love for others. Thank you so much! And BUMMER! I just found out that my server has a virus so we will be "down" for the duration of repair. If I can't get this up as my feature this week then I will definitely feature it next week!! So sorry, but virus have to be killed! How I love this. What a great reminder that our love comes from Christ. How often we try to give away what we've not taken time to receive. Congrats on being featured at Grace and Truth this week! This is great. I am refreshed when I look up and into the Word as opposed to my own loving "work," so thank you for this reminder. Found you via Grace and Truth Link up through the Brown Tribe. Have a great week!